Five years later E. M. Sammis, the town’s first but brief resident photographer, returned from a stint in Olympia to resume making portraits of locals and sometimes when they lacked cash trading his art for vegetables. 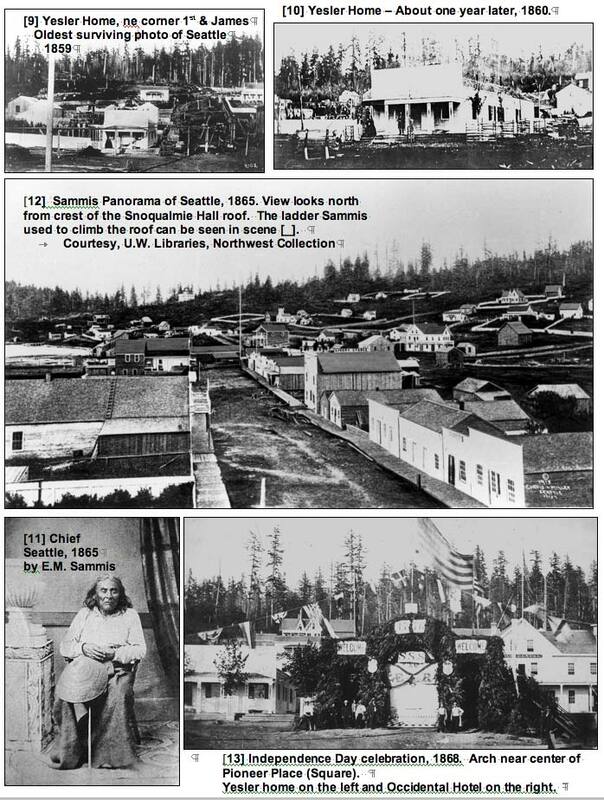 Thankfully Sammis also photographed Chief Seattle – for this privilege he may have paid the chief – and the young town’s first panorama. The 1865 view from Snoqualmie Hall at the southwest corner of Commercial (First Ave. S.) and Main Street is not very revealing of the waterfront, showing only a small section of it on the far left. However (as we will show later), four years later, this same prospect would be used by the visiting Victoria-based photographer G. Robinson and, as already noted above, his wider and sharper panorama is very revealing.